New biometric IoT interaction points, loaded with AI and virtual assistants, allow passengers to immerse into a fully seamless travel journey. These are just some of the innovations to be presented at the Stockholm Passenger Terminal Expo 2018 kicking off today. “It is now widely evidenced that passengers want a fast, hassle-free journey through the airport. " “Transforming the Passenger Lifestyle”: This is the company’s motto for the new 2018 campaign aimed at the digital transformation in the aviation segment and inspired by the expectations of modern passengers of a seamless airport journey. Today’s passengers are demanding an experience, where they feel in control of their journey. They expect a continuous, stress-free flow without queues, as well as comfortable environments and enjoyable interactions with the airport and the airlines, reflecting respect and value for the business they generate. 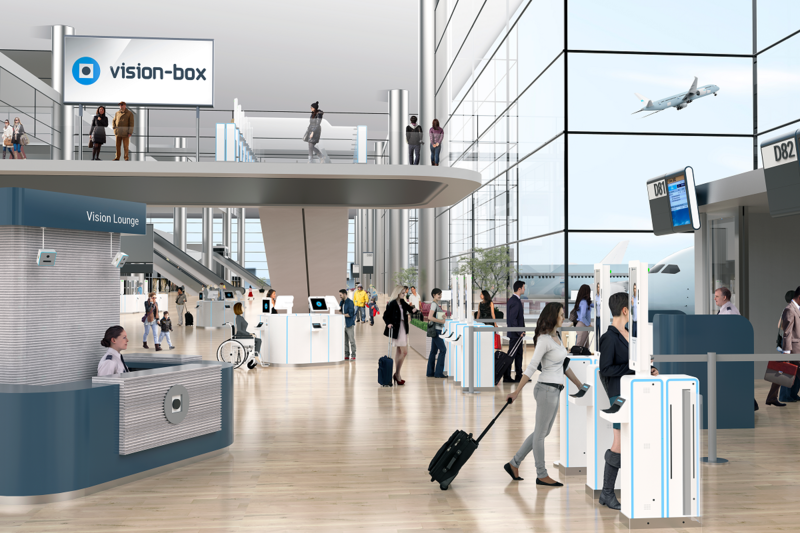 Vision-Box’s newly designed passenger touch points are the answer to such demands. They allow easy-to-navigate, self-service, on-the-go transactions that constantly fulfill the passengers’ needs of speed and control, whether crossing the border, going through security, accessing the lounge, or making purchases at airport boutiques, to finally board on-time. Modularity, small size and connectivity, in association with IoT and AI technology, have been the main drivers for the development of the new product line. A handful of standardized modules, each one with distinctive functionality and connected to OrchestraTM, can now be freely combined to build versatile biometric touchpoints for any passenger processing purpose, all providing the same experience, whether at check-in, baggage drop, security checks, border control, lounges or boarding, or even by retrofitting of existing equipment. Repeated recognition patterns throughout the journey bring familiarity and a positive user experience, providing a sense of control and accomplishment. Passengers take full control of their journey, using their biometric identity to explore the airport, book services, make purchases and receive personalized information. Passports, ID cards or boarding passes have only to be shown once. For the rest of the journey, your face is your passport. The passenger is ready to be recognized instantly by dedicated biometric IoT-enabled devices everywhere. A simple glance at a smart IoT companion will trigger an instant passenger identity verification at any journey point: baggage drop, security checkpoint, immigration clearance, lounge entrance, souvenir purchase, boarding or even simple information request. Airports, airlines, and authorities manage the entire passenger experience through Orchestra™, a powerful multi-stakeholder and shared services platform. The software suite takes the form of singular but interconnected IoT devices and frontend applications. These are designed to provide interactive decision making and real-time monitoring of passenger journey, security operations, business rules and workflows configuration, business intelligence and big data analytics, along with other supplemental features that add to the airport management, enhancing efficiencies, security and revenue. Certified “Privacy by Design” is natively embedded into the platform to guarantee compliance to all privacy-related legislation at stake. The small form factor pays tribute to the company’s name: it’s a “vision box”. A smiley-looking small sized cube allows for simultaneous short range and long range facial identification, offering exceptional biometric capture performance for any airport context. It’s designed to fit any desk, totem or hanging from the jet bridge ceiling, building a network of small-footprint friendly faces around the airport supporting contactless passenger flow. It also requires minimal effort from the passenger, as it recognizes them on the go, keeping them connected along their journey. Vision-Box is currently working on a number of pioneering projects to advance the digital transformation of airports and airlines worldwide, including Amsterdam Schiphol Airport, KLM, Sydney Airport, Aruba Queen Beatrix Airport, Los Angeles World Airport, ANA Lisbon Airport, among others. The presentation of the new IoT line of touchpoints and Seamless Airport 4.0 happens this week at Passenger Terminal Expo 2018 in Stockholm. Distinguished guests and Vision-Box ambassadors will be on-hand for meetings throughout the Expo and for full, live demonstrations of the new solutions. Contact us at whatsnew@vision-box.com to schedule a meeting!